Architecturally, Pevensey Castle was a mixture of styles and materials from two very different eras. Originally a Roman fort, it lay derelict for 600 years, but by the Norman Conquest still had substantial defensive walls. It was granted by William the Conqueror to his half-brother Robert, Count of Mortmain, who repaired and refortified it. Among the refurbishments was this 11th-century rectangular keep, which incorporated the original Roman east curtain wall and bastion. The castle was besieged in 1088 by William Rufus and in 1147 by King Stephen. 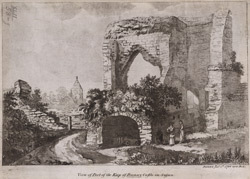 By the 16th century it was derelict again and the walls had fallen into ruin, as can be seen in this 18th century picture.